Brand new contemporary style villa maintaining the practically of today's home. The symmetrically designed two story villa is South facing enjoying views over the garden, swimming pool and La Concha mountain. Offers on the main level an spacious living room with dining area and fully fitted open plan kitchen with Bosh appliances, a guest cloakroom and 3 bedrooms,3 bathrooms, two of them en-suite, the master bedrooms en-suite includes an open plan concept bathroom with a picture windows with lovely views to the back garden, bath and separate shower. The basement comprises a large living area ideal for play-cinema room, an additional large bedroom, maid's bedroom, a bathroom with shower a second guest toilet and storage room. At the entrance of the house there is a garage for two cars. The garden area landscaped in a contemporary style in perfect harmony with the house. Located in the Golf Valle within walking distance to the five starts Westin La Quinta golf hotel and the club house. 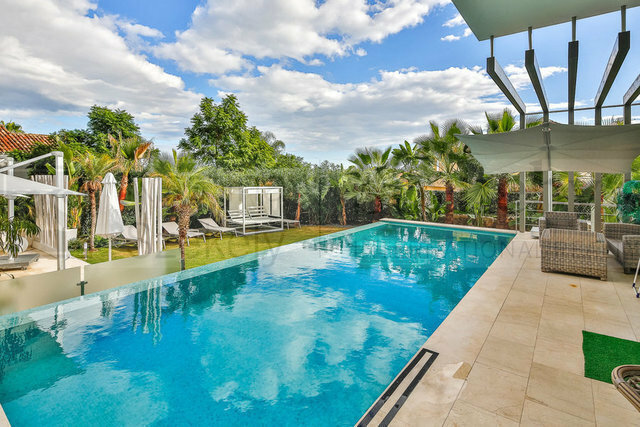 This property is only a short drive from the trendy restaurants and fashion boutiques of the famous Puerto Banus.